Texas A&M University has teamed up with game-based learning company Triseum to introduce gaming into art history survey courses, in an effort to help students better understand the world in which works of art were created. 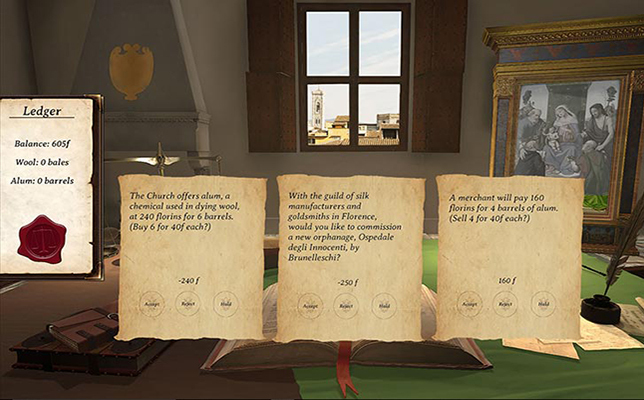 Through a three-year agreement announced Friday, the university will integrate the company’s ARTé: Mecenas, an immersive art history video game that transports students to the Italian Renaissance of the 15th and 16th centuries. They can experience the political, social and economic factors of that time period through taking on the role of a merchant or banker within the Medici family. For example, students are tasked with balancing relationships between stakeholders in that time period (merchant factions, the Catholic Church, etc.) to build and maintain a financial empire. To analyze alternative banking practices to avoid the appearance of usury and condemnation by the church. Instructors are given a dashboard that provides class and student gameplay statistics to monitor progress and engagement. They also receive an implementation guide and other resources for integrating the game into their courses. Triseum was born out of the LIVE (Learning Interactive Visualization Experience) Lab within the Texas A&M College of Architecture’s Department of Visualization, which works to incorporate game technology and methodologies into the classroom experience and education research. Triseum continues to work closely with faculty and students through various game design collaborations and offering professional opportunities. Texas A&M students have been piloting the game since its launch last summer, according to a prepared statement. Now, the university will expand the game’s access to 1,500 art history students, enrolled on campus and online. "Triseum's game-based learning approach has proven to be an effective pathway to deliver a highly engaging, outcomes-driven learning experience," said Tim McLaughlin, department head and associate professor in the Department of Visualization, in a statement. "Through playing ARTé: Mecenas, our students are driven to think more critically and connect with the content on a more profound level. What really resonates is their excitement for the game and their motivation to master the subject matter." To learn more about ARTé: Mecenas, watch the video below. Further information about the game is available on the Triseum site.